Happy September! September 1st ushers in my favorite time of the year (September 1st-January 1st), the most magical time of the year, if you ask me. So today is a good day! There are 30 magical days in September, and whether you choose to spend them or not, in 30 days, they'll be gone. So take charge of life and enjoy every single one of them. As always, I have some suggestions. 1. CELEBRATE FALL. September 1st is my national celebrate fall day. Yes, it's early. But life is short and I really like pumpkins, okay? 2. Spend an afternoon by the pool and soak up the last of summertime. 3. Enjoy the last of fresh summer fruit. There is a beautiful time when you can be in a autumn-decorated house that smells like pumpkins while you are enjoying peaches and watermelon. It's the golden hour, my friends. Enjoy it. 4. Put your planner to use. I don't know about you, but this month seems to fly right into October, which flies right into Thanksgiving, which flies right into Christmas every single year for me. If you have things you need to do over this season, write them down now. 5. Hit up Starbucks for your first pumpkin spice latte of the season. One of the most joyful days of the year! 6. Try copycatting the PSL at home. 7. Journal. Fall always puts me in the mood to curl up with a pumpkin spice coffee and write about life. If you need some help getting started on this one, click here and here. 8. Throw stuff away. We are entering a season where you will inevitably end up with some more stuff. Get rid of the stuff you no longer love! 9. Stalk your local grocery store for pumpkin flavored creamer. Tweet them if necessary. 11. Set your alarm a little early so you can spend a little extra time in bed in the morning with your coffee. Do this once, and I bet you'll do it again. August makes me want to sleep in and scarf down coffee on the way to work every day; September makes me want to wake up in time to enjoy the morning. 12. Buy some sunflowers. Real or fake, they make your house look happier. 13. Go to Hobby Lobby and get some pumpkin decorations. And when someone tries to tell you that it's too early for that, you just tell them that I've had my decorations out since September 1st. So there. 14. Talk about your Thanksgiving plans with your significant other. Yes, it's early, but this is the very best holiday related marriage advice I can possibly give: Make your holiday plans early. Make them, clear them with everyone, and stick to them. If you plan early, then any fighting about how much time you spend where also happens early, and it doesn't ruin the magic of the holidays. DO IT. 15. Start a fall-themed pinterest board. 16. Make a fall bucket list. 17. Buy pumpkin/apple/fall scented candles. 18. Watch a sunset. A whole hour earlier, now. 19. Make an Autumn in New York Pandora or iTunes station and let Frank Sinatra and Harry Connick Jr. swoon you with all the Autumn feels. 20. Get some fall colored nail polish. Put away the neons and break out the darker colors! 21. Plan a fall date night. This is one of my favorite things ever. We have a fall date every October, which is obviously the best month for a fall date. But once you're an adult, things take a lot more planning and scheduling. So start planning now! 22. Make a playlist of songs that remind you of the changing seasons. Mine has All Too Well, Come Away with Me, Wildest Dreams, Autumn in New York, The Way You Look Tonight, It Had to be You and about a thousand more. 23. Buy something new and fall colored. When the fall clothes hit stores, it makes me want to buy an entire new wardrobe. Since that's just not feasible, I like to buy at least one thing--a new sweater or a pair of boots or a hat--that makes me feel like I'm ready for fall. 24. Find a workout you like. This is the season of eating tons and tons of baked deliciousness. Better try to combat that a little bit. I, however, will be taking full advantage of my first holiday season being pregnant. Give me all the cupcakes, ever. It's for the baby. 25. Look through those cookbooks your mom gave you. Summer is the season of salads and easily thrown-together meals, but fall is the season of cooking more. Try it! 26. Take a minute (or an hour, or a morning) and just be thankful. Set aside some time to focus on the good about where you are in life right now. Even if it's not where you thought you would be, think of everything you have to be thankful for this season. It really sets the tone for your month. 27. Surprise someone with a coffee. A pumpkin spice, preferably. 28. Decide your priorities. Fall is such a cozy season, but it also brings along the hustle and bustle that won't leave until after the holidays. Decide your priorities so you don't get overwhelmed. 29. Start thinking about Christmas gift ideas. I know, it's entirely too early. No, I don't start celebrating Christmas early, too. But here's the thing: If you have a loose list of who you need to buy gifts for/what you want to buy, you can start being on the lookout for sales and cheap ideas, which saves a lot of money in the long run! 30. Make an effort to make more meals at home. Speaking of money, we're entering into a season where a lot of it will be spent. Cooking at home saves SO much money, and it can just add to the coziness of fall. Do it! 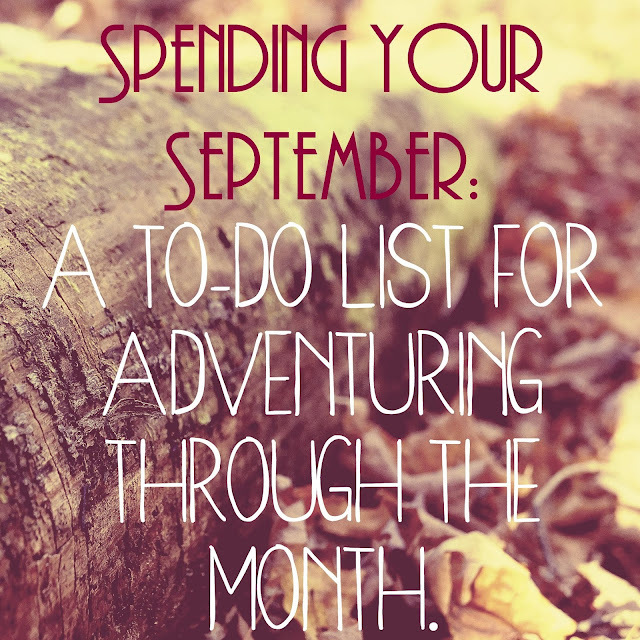 How will you be spending your September? I'm so excited for September! Always love your monthly lists! So excited for fall- these posts put me in the best mood! I'm so excited for fall:) Thank you for this list! You always do the best lists! I love these lists of yours! Gets me so excited for the month :) I love fall! Great post! Love this season. : ) I put all my fall décor out today! I absolutely love your list, thanks for sharing! YES THE PUMPKIN SPICE EVERYTHING. I found some creamer but don't know what to put it in? SOS help me :) Your fall playlist sounds so chill and cozy. I WANT IT. Yes to all those fall songs. Fall always makes me want to pull out the jazz. I always love these posts! I've actually had some of my decor up since Sunday which was August 30th, I just couldn't resist!! Lots of good ways to spend September on this list!! Everything BUT the PSL stuff mentioned, lol. I cannot wait to start using my Fall polish but I'm holding on to my neon as long as I can! omg.. you're so right.. we have to start thinking about christmas gifts! Spending September. I love that! Time to get things done and live it up at the same time! OMG, I love lists, and I love fall, so this was pretty much perfection to me! I put out my fall decor on September 1st, too! As quickly as this season flies by, we definitely need to allow as much time as possible to enjoy the warm and cozy colors of autumn decorations. Man, I'm so giddily excited about fall now! Oh, hey, any suggestions for fall dates? I was intrigued by that idea. I may have taken advantage of an Ulta sale and purchased a few fall nail polishes. And by a few I mean over a handful. Probably too many by most standards, but they're pretty! And I paint my nails a lot. :) Great list!